What has changed since we spoke with Donald Taylor about the 'training ghetto' in 2014? The risk he described - that L&D professionals would be marginalised by failing to adapt - is still very much present. What are CEO's looking for from L&D? They still want exactly the same thing that they have always wanted from every business function. The function is working on 'the right things'; that the team is properly aligned with the needs and direction of the organisation. That the L&D leader shows strategic thinking. But what do those three simple things look like in Learning & Development? We see a real moment of opportunity right now; the global skills shortage is prompting increases in both budget and influence for L&D. However, with this opportunity comes the expectation that the L&D leader is focussing effort on the things that matter to their specific organisation; that learning activities are aligned to business strategy. There are similarities in the methods and tools across all companies - e.g. most companies deliver some form of compliance training, most companies have use of an LMS, most companies are moving toward digital. However, CEO's want confidence that their L&D teams are aware of and working hard to close the skills and performance gaps that are specific to their workforce. Building out business partnering capability and running regular skills audits will support this. Akin to internal account managers, learning business partners are trusted advisors to business units in the company. They market and facilitate the use of available learning services (e.g. classroom training sessions and off-the-shelf content catalogues) and understand what the business needs to perform. This is communicated back to the L&D team and informs the roadmap and allocation of resources. Having an active channel of communication to-and-from the business keeps L&D focused and keeps the business informed. Skills audits give precise data to inform the design of learning programmes and wider HR initiatives. Using simple survey tools or more nuanced micro-learning services, L&D can analyse exactly where skills gaps exist. From there, they can build learning campaigns that a) address validated needs and b) are specific to each group. L&D teams who are active in the business, listening to strategy and responding with precise current data on the skills gaps in the organisation, are strategic advisors to the CEO. They are not waiting to be instructed, they already know what to do. So, find out what the right things are and put your effort there. Once an L&D leader is focussing on the right thing, they need to evidence that they are not wasting resource doing it. How can we be more efficient? Moving operational responsibilities to other areas allows the L&D manager to focus efforts on what only that team can do. This is more efficient and demonstrates strategic thinking and decision-making to the executive layer. L&D operations and administration can be complex and require the fluid integration of many systems and processes. A Learning Management System relies on HR data, IT account integration and IT infrastructure. Managing global classroom training means close work with local offices and facilities. The L&D function, whether using a complex IT system or face-to-face interactions or both, often rests on highly manual processes. Many of these will remain so; many can be automated. Systems integrations, made increasingly achievable by API’s, can automate the flow of data between learning applications and HR systems. Learner profile data, names, locations and such, are automatically drawn into learning systems. Reports can be scheduled to run automatically and, using powerful presentation tools like Microsoft’s Power BI, be automatically collated into real-time dashboards available to managers across the organisation. The trend toward online learning is set to continue in 2019 enabling learners to pull digital learning on-demand. Taking this a step further, we can use adaptive learning systems. These Learning Experience Platforms (LXP’s) automatically recommend relevant content to our learners... which leads us neatly to enabling others to manage their own learning. 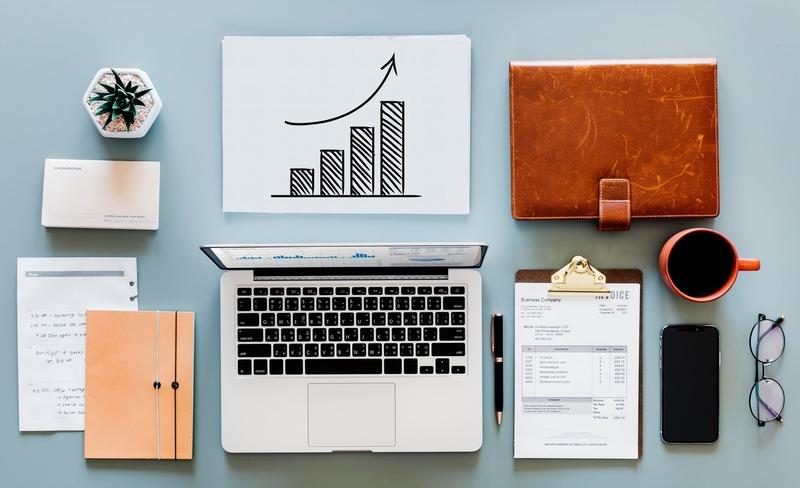 In 2019, 59% of talent developers spend more of their budget on online learning than they did three years ago, and 39% say they spend less on instructor-led training (ILT). L&D (or talent development) is now recognized as a distinct discipline with capabilities to offer to the business that other functions cannot. This realization comes with the expectation that L&D focuses effort on the activities where it can add real value. Also that it lets go of many of the responsibilities that are better managed by others. This means a fresh look at some traditional L&D activities where evolutions in technology afford new thinking. Adaptive learning platforms, like Percipio, come pre-loaded with comprehensive catalogues of rich content. Learners are empowered to take control of their own learning and pull the support they need when they need it. L&D can step back from supporting individual needs. Learn more about self-directed learning here. Developing digital content is easier than ever. Some LXP’s, like learningCloud, have simple content development tools built into the online application. Often L&D teams are relied upon to reformat and publish content on Learning Management Systems without substantially changing the content itself. Where this the case, the L&D leader can enable business units to develop and publish learning content themselves. The time released is deployed on projects where L&D can offer more value. Many learning services can now be delivered by external vendors. The costs saved by the business are not insignificant. 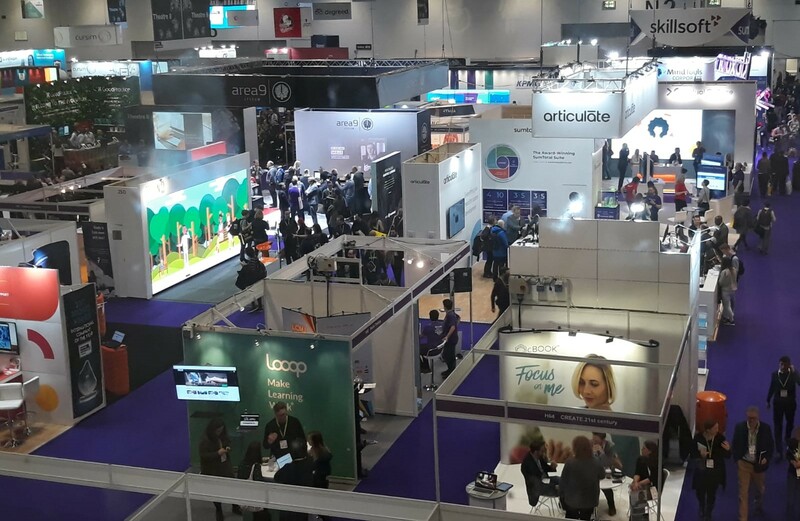 Nelson Hall indicates that outsourced learning activities are 25% less expensive and Fosway research shows that 17% of organisations are increasing their outsourcing budgets in 2019. None of this discounts or diminishes the value of the learning & development function internal to an organisation. Quite the opposite; the aim is to free up time for that function to do what only it can do. That is - a strategic partnership with their business, managing programmes unique to that organisation and taking an executive lead on talent development. Anything that can be done to allow greater focus on that aim should be done. Measurable ROI is key for any C-level executive. LinkedIn's 2017 report showed that while 90% of business leaders believe that L&D is vital in closing skills gaps, only 8% could confidently see their direct business impact. On top of that, a mere 4% could see a clear ROI from L&D. It followed that only 60% of L&D professionals felt that they had a ‘seat at the boardroom table’. 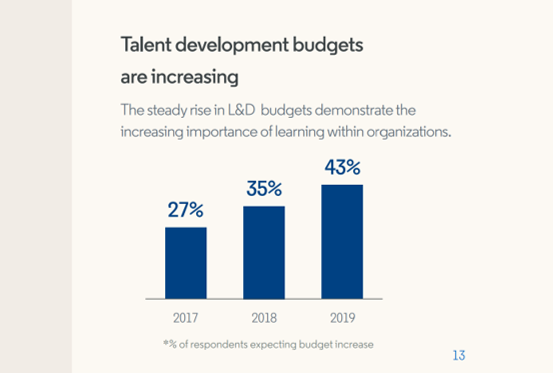 Now, in 2019, the role of learning in employee engagement is clear and L&D budgets are rising to support this. However L&D leaders cannot confidently act without presenting data that links their effort to business strategy and performance. Traditionally, learning & development has presented two sets of figures to evidence value to the business. The first is Volume (e.g. the number of users who have successfully completed an online course). The second is Likability (e.g. the number of attendees who have enjoyed a face-to-face training session). If these activities include well-designed assessment, a third metric, the acquisition of new knowledge, might also be presented. The problem with these figures is that they track the efficacy of the content or the trainers but not the actual change in the performance of the learners. Other business functions have evolved. In digital marketing, few executives are persuaded by how many times an advert was clicked or if viewers 'liked it'. They are looking further down the marketing funnel toward actual conversions to leads and even sales. In L&D, we need to move past showing that our activities have been well-used. Instead we need to demonstrate that a) learning has been applied in work and b) that the application of that learning boosts the performance of the company. C-level executives are not interested in the details of our methods nor the skill of our teams (e.g. if the training was "good"). They are interested in our impact on the organisation. Drawing a distinct causal relationship from our actions to results is not easy. In a complex business environment, it may even be impossible to extract. There are too many variables - different cohorts of learners, different geographies, other support functions also acting to drive positive change - to confidently point to the L&D activity and state that this activity alone was responsible for that change. But we cannot be paralyzed by this. If we can apply deliberate and sustained effort to improve a set metric then we track our success by that metric. Even if other services, like communications and HR, are collaborating with us. We can look at examples of common L&D programmes and metrics that could be used to indicate success in addition to volume and likeability. Sales enablement. A sustained effort to educate sales staff on a new product range should result in more qualified leads. Onboarding. The time to productivity for new hires is a compelling talent metric in any organisation. In some roles, e.g. a service desk technician, tracking productivity is straightforward. In others, the most reliable method may simply be engaging with the line manager. Whatever the method, a CEO will be interested in activities that get new hires performing quickly. Project management training. If accurate data has been used to align learning interventions with actual need, then tracking the real impact of those learning interventions is easier. An example of this might be running a skills audit to identify which group of PM’s need to demonstrate better risk management. Should fewer risks occur in that group, we can assume the learning intervention has been effective. Systems training. When new applications roll out across the business, L&D often delivers support. Helpdesk tickets on that application should reduce where L&D has been active. Self-directed voluntary learning. Where completion rates (volume) will yield valuable insights are for voluntary learning programmes - i.e. courses and resources that are not mandated to employees. Here, completion rates do indicate usefulness (or no one would take them) and the topics used can give valuable insight. For example, a surge in stress management in a particular region may prompt a closer look. Taking these measures to the next level, you can begin to draw comparisons. For example, have retention rates for staff who have come through your onboarding programme improved compared to previous years? Are staff who avail of self-directed voluntary learning promoted faster? Tracking usage and satisfaction with your learning programmes is an important first step and we should not be dismissive of it. However, we do need to look past that toward actual tangible results. So what do CEO's want? They want, and need, trusted advisors in the C Suite who can confidently improve business performance and advise on strategy. They want confidence that their leaders are making the right decisions. The time is right for L&D to be that trusted advisor and to take a seat at the boardroom table.